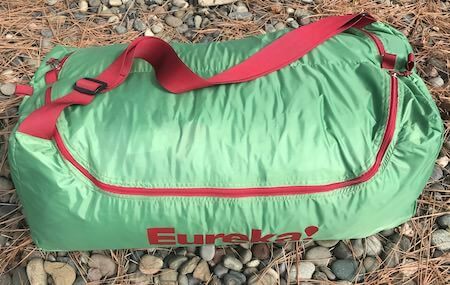 The new for 2018 Eureka! 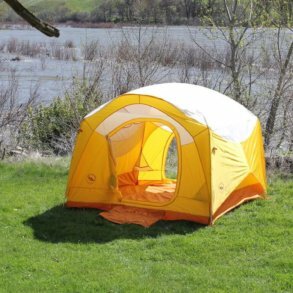 Boondocker Hotel 6 Tent is versatile, robust and roomy. It’s tall, has great ventilation and it boasts a massive gear garage. The Boondocker Hotel 6 pole system is sturdy. 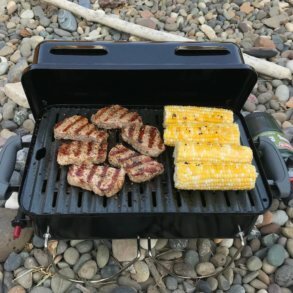 Because so many of us are looking into new tents for the upcoming camping season, we wanted to get you a first-look review right away — our initial experience with the tent. 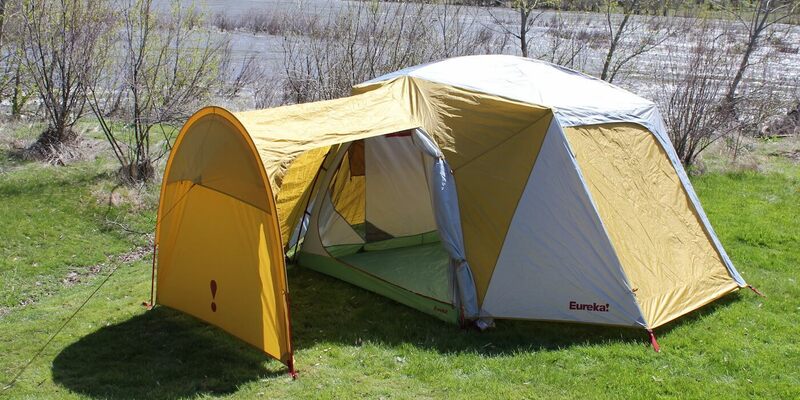 As for Eureka!, the company has produced excellent tents for decades, and the Boondocker Hotel 6 Tent is no exception — it’s truly an excellent tent. Let’s start with the poles. The aluminum poles are robust, which you want any time you have a tent with near vertical sidewalls and a lot of area to support. The roof portion has a stout central hub that connects 6 poles, two of which end in a strong Y-bracket that connects to two stout legs on each side of the main body of the tent. When it all comes together, it’s decently sturdy — and very sturdy once you get the rain fly on and stake it all down. 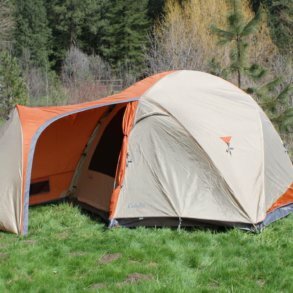 The rain fly, by the way, is the piece that ties this whole tent together because it includes the gear garage, which is basically a giant vestibule that comes off of a side door to the main sleeping area. The Boondocker Hotel 6 gear garage is massive. The best camping tents usually have large vestibules or better yet, gear garages. 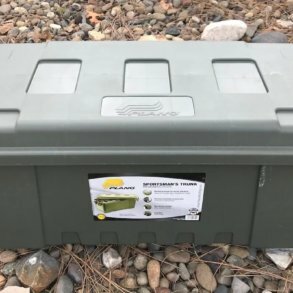 These are basically areas where the rain fly covers a door and/or extends outward to cover an area where you can store your boots and gear. If you have a tent packed with sleepers, the vestibules and gear garages also work great for stowing duffel bags or camp stoves or coolers out of the sun, etc. The gear garage on the Boondocker Hotel 6 is massive. 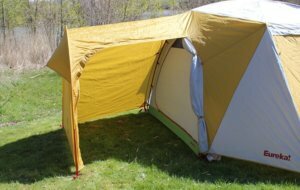 In addition, it’s relatively tall so you don’t have to bend over so much when you’re stowing gear or using it as a entry to the main tent. While the main tent is freestanding, the gear garage is not — to give it shape and stability, you’ll need to stake it down. If you get caught in a rain storm and need to spend a few hours hanging out in the tent — especially if you’ve got kids or dogs — you’ll appreciate the extra space in the gear garage. Plus, the front door rain fly extends out from the main door, so you could open the fly when it’s raining so you can look outside, not worrying about rain getting inside the sleeping area. The rain fly has one more trick, though: The section between the gear garage and the main door can lift up to create a sun shade, which also increases air flow on hot afternoons or evenings. Check out the Eureka! Boondocker Hotel 6 at Moosejaw and get free 2-day shipping on most orders over $49! We’re big fans of the pole system. One thing that struck us is that Eurkeka! did a great job of thinking through the details with the Boondocker 6. For instance, the back side wall of the tent has a mesh window. Below that mesh window is a long zipper. You can use this zipper to zip up the rain fly window from within the tent. Nice. There are also plenty of mesh pockets for stowing phones, eye glasses, flashlights, or car keys, and Eureka! includes a handy hanging gear shelf for odds and ends. 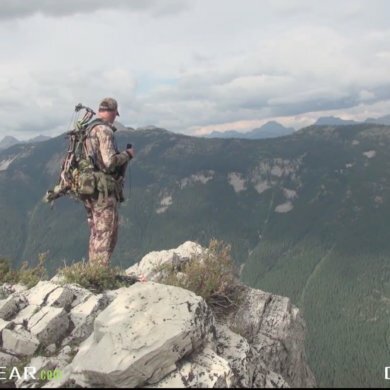 The rain fly gives you full coverage while also having high-low venting. Surprisingly, Eureka! 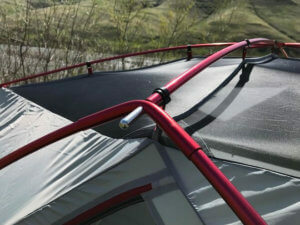 includes a footprint to help protect the bottom floor of your tent! Most manufacturers offer footprints as add-on accessories for a relatively steep additional cost. In fact, when the footprint first came out of the bag, I looked at it for a few seconds wondering where the heck it was supposed to go before I realized it was a footprint — I was that surprised. When you’re camping on muddy or rocky ground, you’ll appreciate this footprint. Finally, the storage bag. 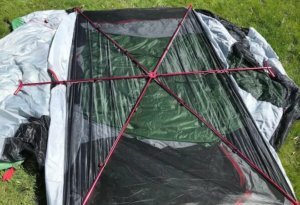 It’s segmented into a couple of sections that make unpacking and packing easier — letting your separate the main body of the tent from the rain fly. You can stow the sections simply by stuffing them back into the bag. Works well. Last of all, the whole package weighs about 20 pounds, which is pretty light for car camping, especially considering all the livable volume the Boondocker tent delivers. Set up and ready for rain. Surprisingly lightweight for the overall volume. About 20 pounds, ready to go. All-in-all, the Eureka! Boondocker Hotel 6 Tent is a can’t-go-wrong camping tent. Highly recommended.